After the brilliant Stand Up to Racism national conference on 21 October, now’s the time to build the resistance and make it clear that anti-racists are the majority in Britain. Sunday 19 November – Football for all! Leeds Stand Up to Racism leafletting at Elland Road against the ‘Football Lads Alliance’ – Sunday 19 November, meet 12noon car park by Co-op / James Reed Health Centre on Beeston Road LS11 8PN (bus no. 1 from town]. Tuesday 21 November, How do we fight Islamophobia? • Other events in November – help SUTR build activity during Islamophobia Awareness Month. Go to Islamophobia Awareness Month UK on Facebook. •January – Holocaust Memorial Day is on 27 January. Leeds SUTR group are planning an event in conjunction with the Holocaust Memorial Day Trust around this time. This National Demonstration has been organised by Stand Up To Racism and is part of the UN anti racism day. At a time when Trump spouts racism on a daily basis from the White House and across Europe we see far right and neo nazi parties being elected in many countries it is vital we make this as big a protest as possible. The Tories want to scapegoat migrants and refugees and blame them for the crisis created by May’s Austerity policies. Continued deaths in Police custody and the rise of Islamophobia haunt our cities. Join the anti racists from Leeds to build the biggest protest against racism possible. Book your place here – the sooner people book their place the more coaches we can lay on! Nazi Graffiti – we say Never Again! 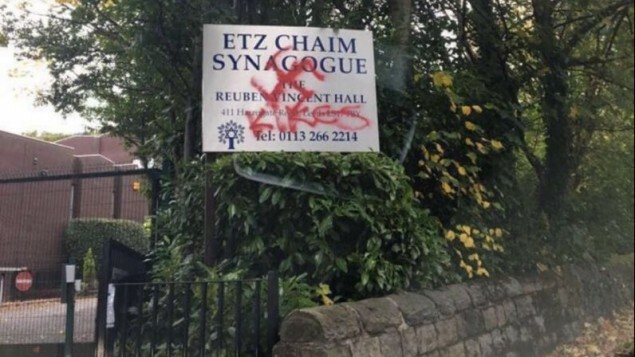 We condemn in the strongest terms the recent foul anti-Semitic attack on the Etz Chaim synagogue in Leeds and offer our full solidarity and support to the worshippers at Etz Chaim and the wider Jewish community in Leeds. Leeds is a proud multicultural and multi-faith city in which people of all religions and none live happily side by side. The person or persons who carried out this shameful attack represent a tiny fraction of our population and their Nazi and hate filled ideology and behaviour is not welcome here or anywhere. We believe unity in the face of such an attack is essential. We stand shoulder to shoulder with our Jewish brothers and sisters. We represent the anti-racist majority. But following the scenes in Charlottesville, USA, where Nazis marched openly chanting ‘Jews shall not replace us’ shows the threat of Nazism is ever present which is why we continue to build the broadest anti-racist movement. Signed so far by: Fabian Hamilton MP, Councillor Javaid Akhtar, Jane Aitchison (President, Leeds TUC), Shahab Adris (Muslim Engagement and Development, MEND), Nick Allen (Branch chair Leeds University UNISON), Steve Wade (Branch Secretary Leeds University UNISON), Imam Mothin Ali (Imam of Al Amin education centre, Leeds), Kauser Jan (Leeds Division National Education Union and MEND), Sally Kincaid (Joint Branch Secretary Wakefield and District NEU), Lesley McGorrigan (UCU NEC and Yorkshire and Humber Regional Secretary), Kath Owen (Leeds Uni UNISON), Shafique Sheikh (Migrant Community Network), Hajji Ashiq Hussain (Chair, We Are Bradford and Bradford UAF), Kate Mayer (GMB), Simon Hewitt (Leeds Uni UCU), Phil Goodfield (Unison), Becky Townesend (Unison), Dr Lisa Long (Leeds Beckett University), Amanda Wignall, Dan McLaughlin, Andrew Lefay (Unison Steward, Harrogate branch), Melanie Ndzinga (Unite union, Quaker), Marguerite Hogg (Labour Party), Emma Bowen, Verity Loughman, Sue Pakorska Hulse, Elisa Caton, Helen Gibson, Leeds Hope Not Hate, Jayne Learoyd, Fiona Callow (Leeds NE Labour Party), Julie Knott, Miranda Mason (Leeds NE Labour Party), Lily Reindl, Jennifer Jones (Disabled People Against Cuts Sheffield), Carry Franklin (NUT), Lisa Walsh (NEU Leeds), Liz Kitching (Leeds Unite Community), Stephen Green, Meg Nino de Guzman, Natalie Whitmore, Susan Nota, Sheila Lloyd, Lawrence Nicholls (Leeds City Council Unison), Jen Silvester-Killen, Vicki Burnett, Jenny Barlow, Cherry Waters (Selby and Ainsty Green Party), Sarah Jane Preston, Jaz Oldham, Dawn Amesbury (Comms and Admin Officer Uni of Leeds Unison), Mark Adcock (Unison rep Uni of Leeds Unison rep), Nick Creighton (Branch Health and Safety Officer Uni of Leeds Unison), Angela Blackburn (Membership Officer Uni of Leeds Unison), Andy Brown (rep Uni of Leeds Unison), Lee Bryan (Equalities Officer Uni of Leeds Unison), Jenna Hudson, Rose Bavage and James Thompson (Uni of Leeds Unison reps), Ms Sam Kirk (Leeds Stand Up To Racism), Raya Ziyaei, Leeds Students Stand Up To Racism, Katie Clark, Robyn Overfield-Whitear, Holly Moffat, Jack Maggs, Alex Draper, Ashleigh Goodenough, Sting Wray, A Taylor, Habibur Rahman, Gisbinder Kandola, Laura Miles (UCU NEC), Christian Høgsbjerg (Uni of Leeds Unison), Ann Callarman, Simon Murch (Joint Division Secretary, Sheffield National Education Union NUT Section).